Door Step School, Pune. : Education Makes The Difference! Every day, thousands of people from several states and villages in India migrate to the city of Pune in search of employment. With the industrial and infrastructural development, Pune keeps attracting people with various backgrounds - from young to old, from unskilled labourers to skilled professionals. The visible differentiating factor among all the migrants is their education, which decides their volume of earning, standard of living, and social status in the city. Fortunately, it is possible to cross the levels by means of education. The work of educating children from migrant labourer families starts with creating awareness among the parents. Parents' participation is considered to be crucial for education of any child. 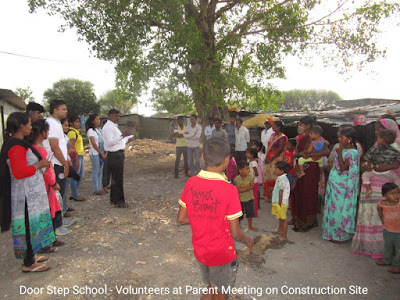 Door Step School conducts parent awareness activities at the labour habitats and tries persuading the parents to send their children to school. Since the migrant parents are not comfortable enough with the local environment themselves, they are further afraid of sending their children away for any reason. As a result, their children remain deprived of education for the duration they live here in the city. Most of the times due to limited social exposure, the parents cannot even imagine how education could have made a difference in their lives. 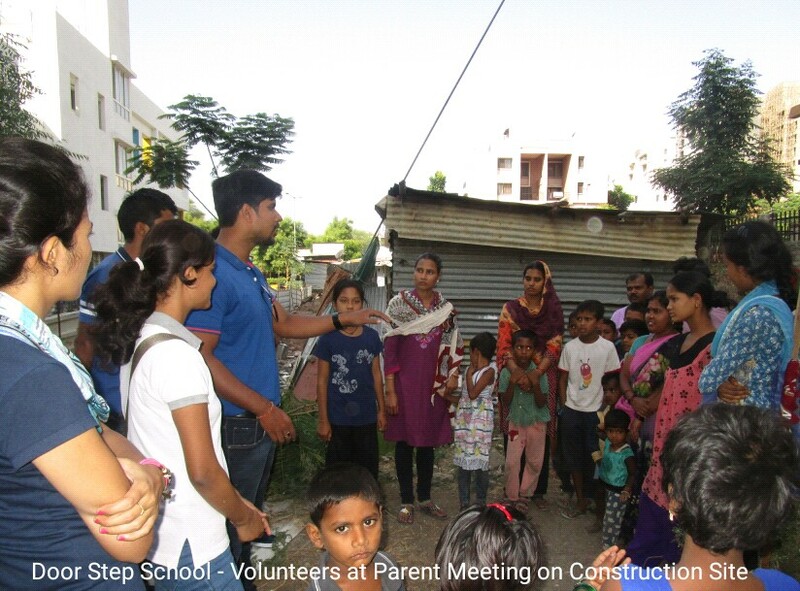 Door Step School field team has a hard time convincing these parents and getting access to their children. Our field team is often supported by volunteers from corporates and institutes. These are the educated people who spend their weekends on the ground, understanding the problems and queries of parents, informing them about importance of education and benefits under Right To Education (RTE) Act, and actually helping their children reach schools. 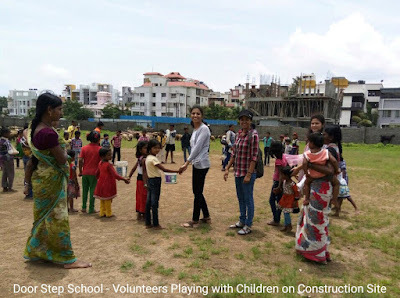 In the Baner - Balewadi area, a group of volunteers from 3DPLM Software Solutions, Hinjawadi is helping Door Step School field team in connecting with the parents. The parents are labourers who usually leave their homes for work before 9 o'clock in the morning. Keeping this in mind, the volunteers turn up as early as 8 AM, sacrificing their weekend plans on Saturdays and Sundays. They start observing activities of our field team for first few meetings, after which they begin participating by talking with the parents and explaining importance of education and benefits of RTE Act, etc. Brahmanand, Shitala Prasad, Namrata, and Bharat are regularly seen at the early morning parent meetings and activities with children. During one such meeting, one of the volunteers, Brahmanand came up with an apt comparison of migration. While talking with the labourers from North Indian states, he said, "Even I am a migrant like you who has come to this city for a job. We hail from the same North Indian states. The only difference between you and me is education. If you want your children to be as successful as I am, please send them to schools now!" This emotional appeal touched a cord and we could see the changed response of parents in further meetings. The volunteers from 3DPLM Software Solutions have also participated in activities like arranging games for children at the vasti, helping the parents in school enrollment procedure, etc. Door Step School thanks all the volunteers for their concern and support. We are sure that the children and their parents are inspired by them and have understood how education can make a difference in their lives!